Interestingly, Heritage made no mention of why entitlement spending is projected to rise so quickly. The fact is that the federal government is projected to spend a tremendous amount of money because the health-care system in this country is severely broken. According to the Congressional Budget Office, the cost of health care is rising so fast that per-capita consumption of all other goods and services is projected to rise only 6 percent between 2007 and 2035—less than 0.2 percent per year. If serious efforts aren't made to rein in the cost of health care, in 29 years it will double as a share of GDP—accounting for fully one-third of the entire economic output of the country. 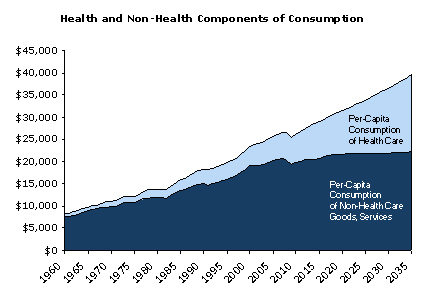 In 70 years, health care will be nearly one-half the economy. And yes, it is the cost of health care, not the quantity that accounts for the spending increase. If federal spending on health care rose only on account of economic growth and aging of the population, it would total 7.3 percent of GDP by 2083. Because of projected cost growth, federal spending is projected to reach 17.8 percent of GDP. Our projected troubles with the long-run deficit would be nonexistent if the United States had health-care costs like any other country with longer life expectancy.